today’s tasty post is brought to you by the sweet and talented naturally ella! are you looking for the perfect online resource for healthy vegetarian eating? well, i’ve just introduced you to it’s creator. so head over and get cooking! you’ll love her seasonal recipes and beautiful pictures. and then come back for these tacos. because mole and crispy quinoa? ENOUGH SAID. andale andale! There seems to be two major food groups in my diet: tacos and spring rolls. Why these two items? They are easily gluten-free and vegan (pleasing almost every eater) and are easily adaptable for any season. 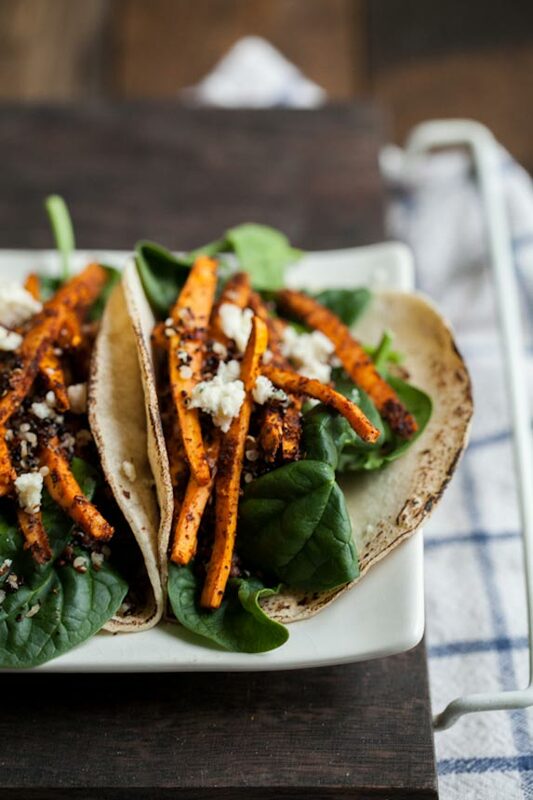 The sweet potatoes during the winter make for a hearty meal that soak up all the delicious flavors. Preheat oven to 350?. Peel sweet potato and cut into 2-3” long sticks that are 1/4” in thickness. Toss together all the seasonings for the mole rub. Sprinkle over sweet potatoes, drizzle with olive oil and lemon juice; toss until everything is well coated. 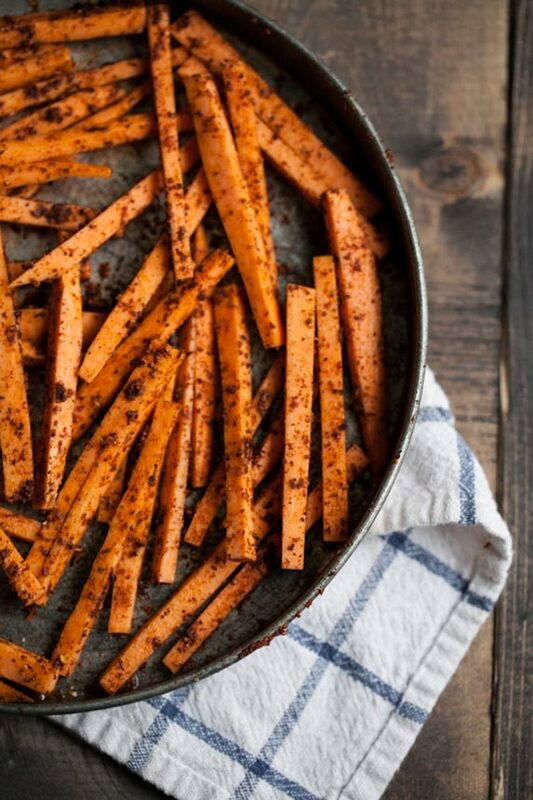 Roast sweet potatoes until tender, 25-35 minutes. Heat olive oil in a skillet over high heat and add quinoa. Cook and stir quinoa until liquid has evaporated and quinoa is crisp, 2-3 minutes. 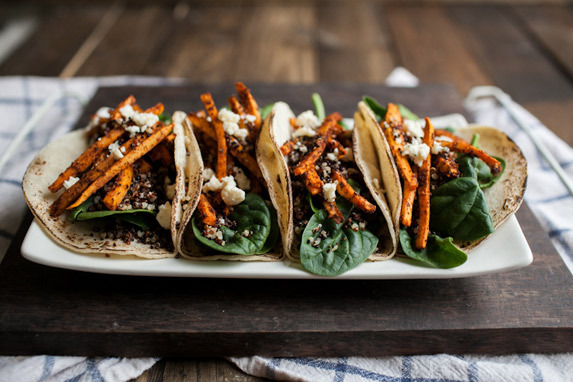 To assemble tacos, layer spinach, roasted sweet potatoes, quinoa, and cheese. Give a quick squeeze of lime juice and sprinkle with cilantro, serve warm. *Crispy quinoa inspired by Sara’s salad. These look so good, and the flavor combination sounds incredible! Can't wait to make this for my daughtersI know the chocolate will be a huge selling point. I am so excited to try this recipe out tonight!! It looks SO delicious. Yummmm…. I just made this tonight and loved it! Definitely delicious, also easy! Just made these and they were amazing! I will be making these again soon.. Also so easy to make! Thanks for posting!! These look so delicious!! And I could probably live on spring rolls and tacos too LOL! These sound FANTASTIC! All that's missing is a margarita! I need this in my mouth, right now. These are just so aesthetically pleasing to look at – they look and sound delicious! I made this last night and really enjoyed it. 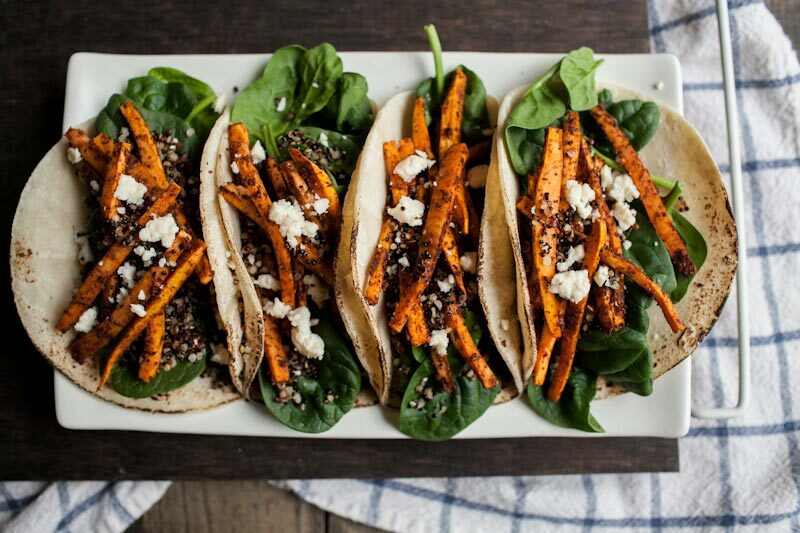 I tried it with the spinach on top but ended up leaving that off as I found it detracted from the flavor of the quinoa and sweet potatoes. I really liked the combination of those with the feta that I used since I didn't have queso fresco or goat cheese. I made these. And made them again. And will make them forever. 😉 Not very many recipes make my “Hot Dang” board, but this one made the cover. I serve them with Cotija cheese and Jarritos. Just the thing, thank you.